The “health” of the current environment is a topic of much debate online. Of course, it can be difficult to find agreement on what exactly “healthy” looks like. For some players, it is essential to have a playable control deck while others might consider that a negative experience. Player of one faction might feel everything is fine while players of another faction might feel change is needed. Each player exists within their bubble of an environment, whether that is local or online, and can only ever have a partial understanding of the current environment. We could consider the current environment to be the aggregate of all local environments combined. This can be seen as a kind of “wisdom of crowds” situation. It is also worth noting that this overall environment does not always reflect the true nature of the game. A developer sitting in FFG head office could put together a perfect game, but if players discount one style of deck while popularising another, the resulting environment could end up unbalanced. This player influence is why the current environment can shift without any change in the card pool. Indeed, it is fantastic to see a game with enough depth that players need to spend some time to get a full understanding of the options available. In theory, there is a perfect environment which will keep the maximum number of players engaged and happy, but in practice, this is largely a subjective debate. Sometimes, however, issues become evident. An example in the current environment would be the poor performance of the Unicorn clan. While there were some claims initially that Unicorn just needed some good players to play them, it is accepted that Unicorn need help. So how do you adjust an environment? The obvious way is to print new cards. Every new pack provides new cards and shakes up the environment. The logistics of that, unfortunately, are quite extensive and it can be several months before any changes could be made in which time the environment may have adjusted. It is also a bit of a shotgun approach; you don’t get to make a few small adjustments but instead release a few 100 cards that completely shake things up. Despite the best of efforts, new cards mean new, unexpected problems. Errata is another approach, just change the way certain cards work. Online card games are able to effectively use this as digital cards can be instantly updated, but until we have an unexpected technological advance, this isn’t an option for physical cards games. As such, this approach is generally avoided as having a card doing something contrary to the wording on the actual card can be very confusing. Especially for new players, without which a game would slowly die. In L5R, deckbuilding is relatively straight-forward. You pick a stronghold, and you pick a role from those available. Those decisions then limit the card pool you can use. Your faction and role determine your options for your provinces. Your dynasty deck can only include cards from the neutral faction and the clan of your stronghold. Your conflict deck is similar but with the additional option of using influence points which are determined by the stronghold and role. These influence points can be spent to add cards to the conflict deck from one other clan. Some cards specifically reference roles, with some only playable by Seekers, some only by Keepers, and with each of the elements receiving their own specific cards. Any adjustments to this process will have an impact on the game. Interestingly, there is already one adjustment in place. Every year the top player at Worlds gets to select a Role that the clan will play for the rest of the year. Also, players who attend Kotei get to vote on the second role for their clan which will be active for the Worlds tournament. The Scorpion selection of Seeker of Void caused some consternation as it denied the Scorpion a powerful Keeper only card. Ultimately, the choice was shown to be an incredibly powerful one, and many other clans now look longingly towards that role hoping they can claim it at the next Worlds tournament. Obviously, these changes are not intended to balance the environment, in fact, the reverse, as players will try to get their faction the most potent option. Unicorn currently has the Keeper of Void role. The designers could open those options up for the clan and allow them to pick from a selection of more powerful roles to increase options. Alternatively, if the designers felt the Scorpion were too powerful, they could take away their current Seeker of the Void role and replace it with one that was weaker. While I suspect people would be okay with the Unicorn change, there would be uproar at the Scorpion change. These roles are won or lost by players, so denying a clan a role they had won wouldn’t look great. There somewhat of a check in place, each clan cannot select the role they had in the previous year. So we know for sure that Scorpion will not have Seeker of the Void next year. The arrival of the Support of the Phoenix role card also opens up a few more options. As the initially available roles were assigned during the release event at Gencon, there was ambiguity over how the new support role would work. It was clear the intent was to allow it as a choice instead of a Seeker or Keeper role, but the rules reference needed to be updated to clarify. This is notable as it means a later ruling could change this. Once the full set of roles are out, the design team could allow access to only certain clans. They could even opt to allow a Support role in addition to a Seeker/Keeper role. In a future tournament, the Unicorn clan might be allowed to play Support of the Dragon or Support of the Crab along with the Seeker of Fire or Keeper of Water roles. Modifying these rulebook limitations could give a nice way to tweak overall power level of a faction without worrying too much about specific cards. Many years ago Magic the Gathering introduced the idea of Banned and Restricted cards. Banned cards are obvious, if the card is on the list you are not allowed to include it in a deck. Banning cards can be a difficult proposition as players typically are not happy when told they cannot play a card they have paid money for. This is the essentially the ‘nuclear’ option, reserved for cards that turned out to be completely degenerate by themselves. Typically, when designers do make this decision the majority of players breathe a deep sigh of relief as the card really was a serious problem. Weirdly, we already have a banned card. Due to the way the role cards work, it is possible to have a card that cannot be played as the clan does not have the correct role. Currently, that only includes Northern Wall Sensei. Restricted lists require a little more explanation. If you have a card from the list in your deck, you cannot have another copy of a different card from that list. So you can have your legal 3 copies of card A from the list but you cannot have 2 copies of card A and 1 copy of card B from the list. The main intent of a restricted list is to separate powerful combo cards. So if you have a situation where a player with card A and card B in hand would instantly win the game, then you put both those cards on the list. now players can play either of those cards but not both. Game of Thrones and Netrunner currently use restricted lists. For Game of Thrones, the list is very small at around 5 in total of which 3 are neutral. Netrunner has a larger list, but due to the nature of the game, those lists are split into one list for Runners and another list for Corp decks. Runners have 3 main factions and Corp have 4, in addition, splash can be from all other factions rather than just one. L5R, in contrast, has a more disparate card pool. There are 7 factions in total and each faction can splash from only 1 other faction. So a deck will contain neutral and in clan dynasty cards and neutral, in clan, and one splash clan conflict cards. So there are 42 distinct card pools. In one way this makes a restricted list more like a scalpel. If you restrict Mirumoto’s Fury and A Fate Worse than Death you know you are specifically targeting the Scorpion splash Dragon deck and the Dragon splash Scorpion deck (which is not a popular deck). Things get a little messier when you try to expand the list. If you add in Policy Debate you end up also hitting the Crane splash Scorpion decks among others. Add in Charge! and now the Unicorn deck is a little weaker. Here we’ve moved from a scalpel to a shotgun again. Another variant of this is to have multiple restricted lists. So players can play multiple restricted cards but only one from each list. For example, one list could have cancels and card denial cards such as Policy Debate while the other list could have efficiency cards such as Charge! This is something that the Star Wars LCG currently does. Alternatively, these lists could be broken up by clans, where each clan has a different list. So you might get Charge! and Policy Debate restricted for the Scorpion clan but not for the Unicorn clan. This can become a bit unwieldy and makes deck building a little bit trickier. In the clan example, it opens the decisions up to player debate. While any option taken will result in a certain amount of debate, one which is different for each clan will generate controversy. In the first incarnation of Netrunner’s “Most Wanted” FFG assigned additional influence points to cards. If you played one of these cards you had 1 less influence to spend on other faction cards. These were universal influence points, so if you played a card from your own faction from the list it reduced the number. The goal here was to make the cards on the list more costly. In practice, people continued playing the cards on the list and spent less influence on cards not on the list. This approached succeeded, in so far as it reduced the power level of decks including these cards, but it left those problem cards in play and did little to shift the environment. Ultimately, it was abandoned. If L5R were to take a similar approach it would have similar issues, but perhaps not to the same extent. In Netrunner players are not limited to just one splash faction, so players tended to play a mismatch of powerful cards from all the other factions. In L5R players can only have one clan as an ally, so if Let Go gains an additional point of influence it will only impact Dragon and Dragon splash decks. Looking for other options, you need to go through the rules reference and consider what additions could be made. The conflict character limitation is an example of one of these. It seems likely that during internal testing, it was found that a deck full of conflict characters was too much, so an artificial limitation of 10 conflict characters was included. If a hypothetical deck appears which uses 30 holdings, this could be pushed back by adding an artificial rule that limited the number of holdings in a deck to 10. A swarm deck that was relying on only 1 cost or 2 cost characters could be put in check by adding an artificial cap on the number of those characters. These are by their nature ‘tacked-on additions’ but are an option. Additional cards can be added into the pool in the same way. The current rules allow conflict cards from other factions to be added to a deck. An amendment to this rule might let players include up to 10 copies of characters with cost 3 or less from the faction being splashed. This would allow a little more flexibility for dynasty decks reducing the imbalance (and negatively the distinction) between decks of different factions. The core point here is that the rules reference is not a fixed document with one true way. The designers can play around with the deck building rules to try tweak how the overall environment works. Player discontent is a constant, like gravity and the sun rising in the morning. One way to mollify players is to keep them up to date on the design considerations. An example of this is the watchlist. When a card becomes a potential problem, the design team need some time to consider and test the issue. With the public watchlist, they then add these cards to list informing the players that they are under consideration for restriction or ban. Players then get to rant a little about it and eventually the card makes the restricted or ban lists or gets removed from the watchlist. It’s a small thing, but it can help show players that design are giving consideration to potential problems. 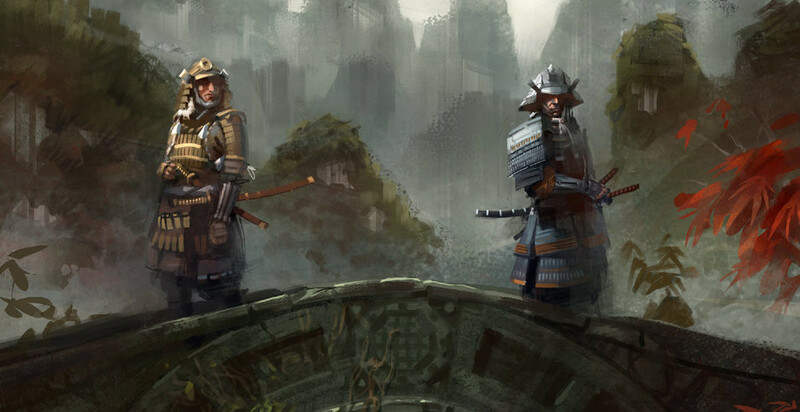 Should FFG alter the L5R Environment? We’ve looked at how we could change the environment, but should they? It is commonly accepted that there are three top decks are Phoenix/Dragon, Scorpion/Dragon, and Dragon/Crab. [Caution: commonly accepted isn’t always the same as true]. The goal would always be to narrow the gap between the top clans and the bottom clans. At the same time, we don’t want to make the game bland and uninteresting. If everyone has the exact same cards the factions would be truly balanced, but much of the flavor would be lost from the game. As the banned and restricted approach is to hinder good cards, we end up looking at the top clans first and then working our way down. Unfortunately there is no clear way to “boost” the Unicorn clan, instead we would need to weaken all of the other clans. Targeting certain cards, however, could help. Cavalry Reserves is a big card for Unicorn and having it canceled can finish a Unicorn’s chances of victory. If there were no action cancels in the environment, Cavalry Reserves would be a much better card. A change like that wouldn’t only impact Unicorn however and could have unintended consequences like strengthening Scorpion actions. In addition, outright removing cancels would remove some of the flavor for the Scorpion and Crane clans. So these are changes that need to be carefully considered. The current environment is relatively young. Active players in the game can be forgiven for forgetting that the game has not had a full year yet. There are still ongoing debates over the relative power levels of clans and why one Kotei has a certain result while the next has a very different one. Scorpion have had a great Kotei season, but now without some challenge. Scorpion decks do need a good player behind the helm to make the cut and even then those good players still need an element of luck to win a big event. When would changes happen? In May we have 3 Kotei, in June we have 5 Kotei, in July we have 2 Kotei, and finally Gencon in August. So there aren’t really any opportunities to introduce a list without interfering with the Kotei season somewhat. That said, there are 10 tournaments between now and Gencon. The only recent change has been the arrival of Disciples of the Void. Realistically, Disciples was a small change. It did push Phoenix into a competitive position but didn’t have much of a direct impact on the decks for other clans. So, we are currently experiencing an extremely long cycle with most decks remaining static since the start of the year when the Imperial cycle released. The next cycle, however, is due out much sooner than we expected. The first pack releases June 28th. As a product is legal 11 days after release, the first pack will be legal for Houston and the first 4 packs will be legal for Gencon. So we are about to hit a big shakeup. And then FFG announced their restricted list. So, if I scroll up we can see I described this as a ‘shotgun’ approach. As the restricted list has 8 cards on it and 2 of those cards are neutral, pretty much every deck in the environment is impacted. From the article it appears that some cards were considered overly efficient while others had interactions that were deemed too strong. Policy Debate was noted as a card more powerful than intended, where as Charge! and Iron Mine were considered an interaction that was too strong. Every clan apart from Unicorn and surprisingly Crane have at least 1 clan card included. Crab actually have two, but an argument can be made that Pathfinder’s Blade is more of a Dragon than Crab card. There are definitely a number of merits for this approach. It is simple and straightforward, one list, pick one card. For the Birmingham Kotei, we just need to show people this list and make sure they do not have two of these cards in their deck. It definitely shakes things up. The top deck for every clan runs at least two of these cards, typically 3. So we will see a shift in the environment. This potential change seems to have given a boost to the players, as we can see a surge in deck discussion, decklists posted, and games on Jigoku. Every clan has been impacted, but some more than others. 4: Scorpion – Policy Debate, Mirumoto’s Fury, Forged Edict, and Charge! 4: Dragon – Policy Debate, Mirumoto’s Fury, Charge! and Pathfinder’s Blade. 4: Phoenix – Policy Debate, Mirumoto’s Fury, Charge!, and Against the Waves. 3: Crab – Policy Debate, Charge!, and Iron Mine. 2: Crane – Policy Debate, and Charge! This list does actually look somewhat like a reasonable tier list, with the most powerful clans facing the biggest hit. Recent events suggest that Crane might be somewhat low on that list but it definitely is a good effort (see here for a poor effort). So what happens? Unfortunately from a variety perspective, for most clans there is a clear choice. One card that they’ll end up keeping at the expense of all others. Scorpion – Keep Forged Edict. Dragon – Keep Pathfinder’s Blade. Phoenix – Keep Against the Waves. Crab – Keep Iron Mine. This will also impact the splashes that everyone plays. If every already has a restricted card in their deck then any splash needs to have no additional restricted cards. Long term, I think I would like to see this morph into multiple groups in the same way the as Star Wars LCG. It might look somewhat like the following (adding a few more cards for measure). Before you roast me, this is isn’t supposed to be a definitive version of the selected cards, merely an example of multiple groups. This would allow the design team a little more room to adjust interactions without having to worry about inadvertently hitting to many factions. It also allows more restricted cards into decks in a controlled manner. In summary, this is a fantastic development. It is a nice shot in the arm that has spiced up the environment that largely has been static. People are excited and actively playing. This also sets a good precedent. Now there is a restricted list, we know the design team have a tool in place that they can, and will, use to tweak the environment when needed. I agree that the restricted list is a good change. No new cards yet but this has sneaked things up a lot. I like the idea you propose of groups of restricted cards. Loved the article, keep up the good work ! Great write up, thank you for the additional insight as always! I definitely agree with the restricted list despite how much it pains my normal decks. But that Pain is a good thing because many of these cards (in the same deck) were absolute no brainers! Choice is a good thing, and hard choices make for better games. Very interested to see where this goes and how they add/subtract from this in the future. I definitely agree that this is a nice shot in the arm for the environment. It shakes alot of the design up and gives cards that were left in a dust a chance to shine, instead of the old nine no brainer cards in literally every deck. A more diverse deck building space is a more interesting environment and help with the bottle necking of design the young games especially lcgs suffer from. burn the heretic!!!! a three tier restricted list is going way over board. now, i am getting annoyed with the assumption that if you are clan x you must have card y in your deck. with the restricted list i got rid of against of the waves and kept fury. the idea baffles me that people assume that we are lemmings because we have same clan and use same splash. sorry it just annoys me.